With four races in just 4 nights at three different towns, the final week’s racing was always going to be the most difficult one for teams to manage with riders and team personnel tiring and struggling to cope with accumulated injuries as the racing became more intense. 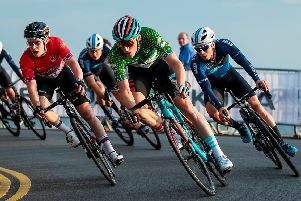 The week started at the super-fast ‘Stevenage Bowl’ on Bank Holiday Monday with a two-lap team time trial before the main event of the evening, the one hour crit around the 1km power riders circuit. 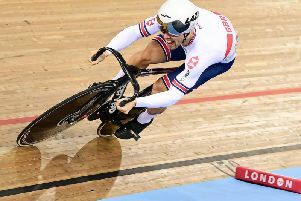 “This is an out-and-out power circuit’ he observed ‘and it’s ideally suited to the likes of Canyon with their track based squad that includes a handful of World Championship medallists. But that won’t stop us doing everything we can to maintain our lead in the Tour Series”. Colin’s assessment proved to be more than correct with Madison slipping to 5th place on the night, their lowest Team finish of the year as Canyon Eisberg completely dominated the night’s racing. “Rain is a great leveller but it is what it is and we still have all to play for”. With the 1.8km circuit revised to take into account the almost ice-slippery conditions, Madison Genesis followed Sturgess’ instructions to the letter and made sure they had four-point scoring riders in the front part of the race throughout, ready to cover any attacks. Conor Swift was at the front of that effort and was on hand when the prodigiously talented Tom Pidcock (Team Wiggins) – a double World Champion and still only 18 years old – used all of his cyclo-cross skills to conquer the conditions and force a gap at the front. Pidcock nearly over-cooked the final corner which appeared to leave the door open to Swift to take the individual win but the youngster kept his head down and powered across the finishing line to take the narrowest of wins. But it was the consistent performance of the Madison squad that saw them take the Team win on the night, narrow their points deficit on Canyon Eisberg and leave it as ‘winner takes all’ for the final race of the Series in Salisbury on Thursday night. Visiting the Wiltshire town for the very first time – and hopefully putting smiles on the faces of the local inhabitants who’ve had the focus of the world on them for all the wrong reasons – Madison and Canyon fought the closest of battles in what was also the 100th round of the history of the Tour Series. Swapping the individual lead of the race on many occasions, the Team standings also swapped backwards and forwards between the two teams as they fought for race and Series honours. And although both teams missed out on the individual win, in the all-important Team competition, it was Canyon who took the top prize on both the night and for the 2018 Series win as well. “Onwards and upwards. I just want to say to the guys, you’ve got my respect, utmost respect to you all not just tonight, the other rounds, the other riders”. The Trek-Drops team will be racing on home roads next week in the OVO Energy Women’s Tour that will see the world’s top women racers fiercely competing from the Suffolk start in Framlingham to the finish in Colwyn Bay in north Wales. Racing over 680kms fitted into just 5 stages, Trek-Drops are in the middle of a block of stages races and their form is starting to produce the results that the riders efforts deserve. Last week saw the team competing at the top level in the Lotto Thuringen Ladies Tour where they finished second overall in the Team standings, had three riders in the top 12 on general classification and had Kathrin Hammes come home with the Mountains jersey. Hopefully a foretaste of what the team can produce in “their” race.